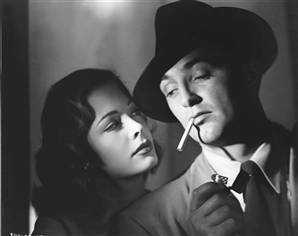 It has probably been about a decade since I entered the realm of 1920s-1940s vintage admiration. 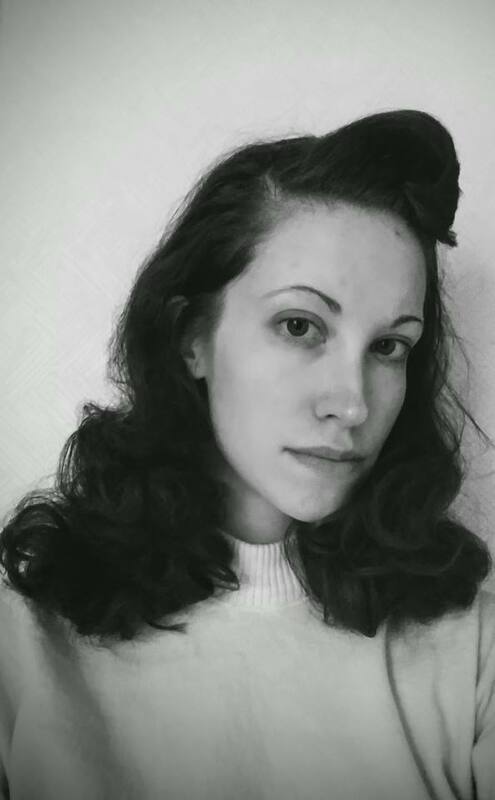 As far as fashion goes, I think many know that the late '30s through 1940s are my favorite years, and one of my biggest ambitions is to achieve the hairstyles of that era. Finally conquering hair rolls was such a triumph, but as for the curls and overall shape of the hair? That has been an ongoing frustration!...That is, until recently. 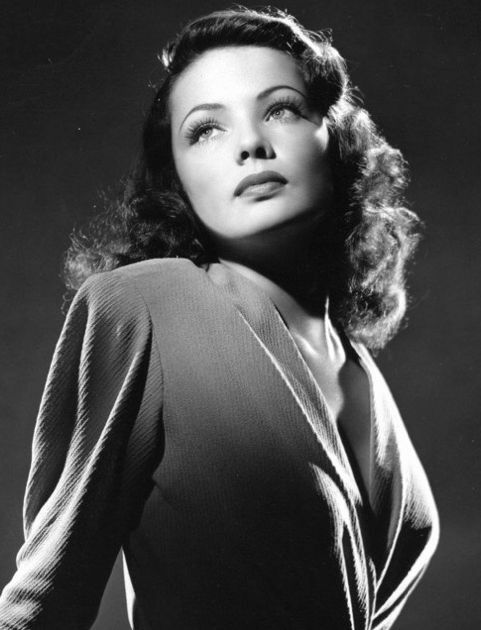 For too long, I believed that, in order to do the vintage hairstyles, my hair had to be all one length. Pin curls and using hot rollers worked great, but something was lacking. 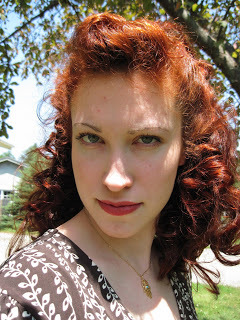 My pin curl style in 2011. Ava Gardner--look at how the curls frame her face and only the lower border of the back of her hair. That's what I want! 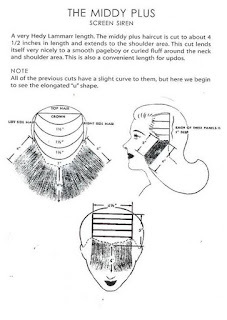 One day, I happened to be browsing vintage hair stylists on Instagram, and noticed one mentioned giving a client a "horseshoe trim." What? I looked this up and only found some...erm...interesting buzz cut styles! So, I hit YouTube to see what I could find out about vintage hair cuts. This video about vintage haircuts by Lisa FreemontStreet mentioned "the middy cut," which I had never heard of before! I downloaded the image of the "middy plus" hairstyle and went to work a bit nervously on my hair. I had vowed to never have layers again, as I thought it would hinder my ability to do rolls, but I've since styled very layered hair on other women, so I thought...Why not? Time for a slight change anyway, isn't it? I kept it longer than recommended in the diagram, as I knew that it would be shorter after curling. First cut and curl result in December. Turns out what was missing was a good brush-out! 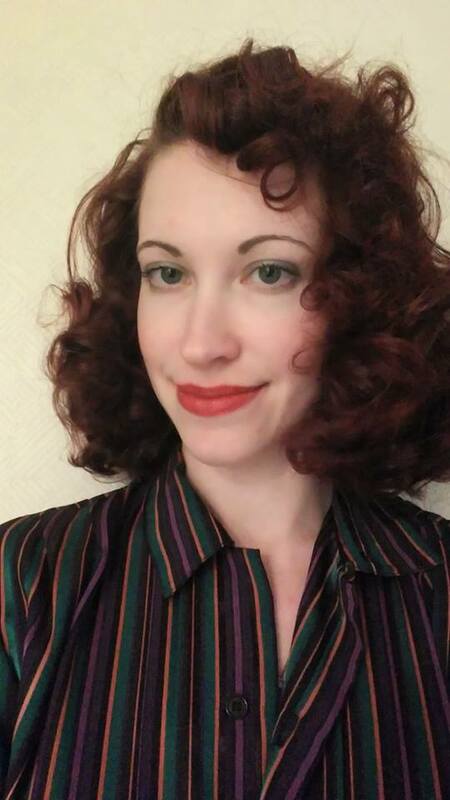 My hair in the picture below looks longer in the above photo because the tight curls have been brushed into waves. Still, wanted to experiment some more, and shortened one side of my "bangs" some more, to get a more face-framing curl. It turned out shorter than I wanted, but still, okay. 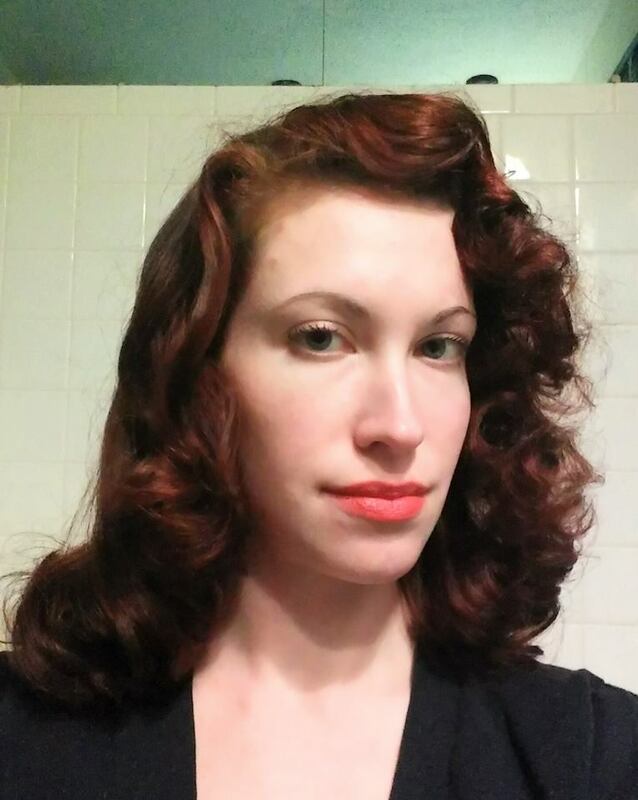 After trimming the front bangs and setting in pin curls. I'm slowly getting to where I want my style to be, I think, though I have a lot to learn about curler placement, and especially about using hot rollers, which is a very different experience since getting the middy. 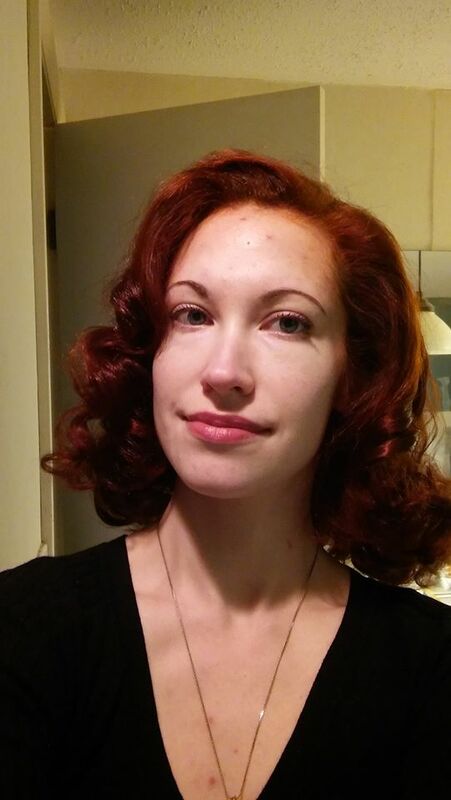 This is how it looks now, after styling with hot rollers. 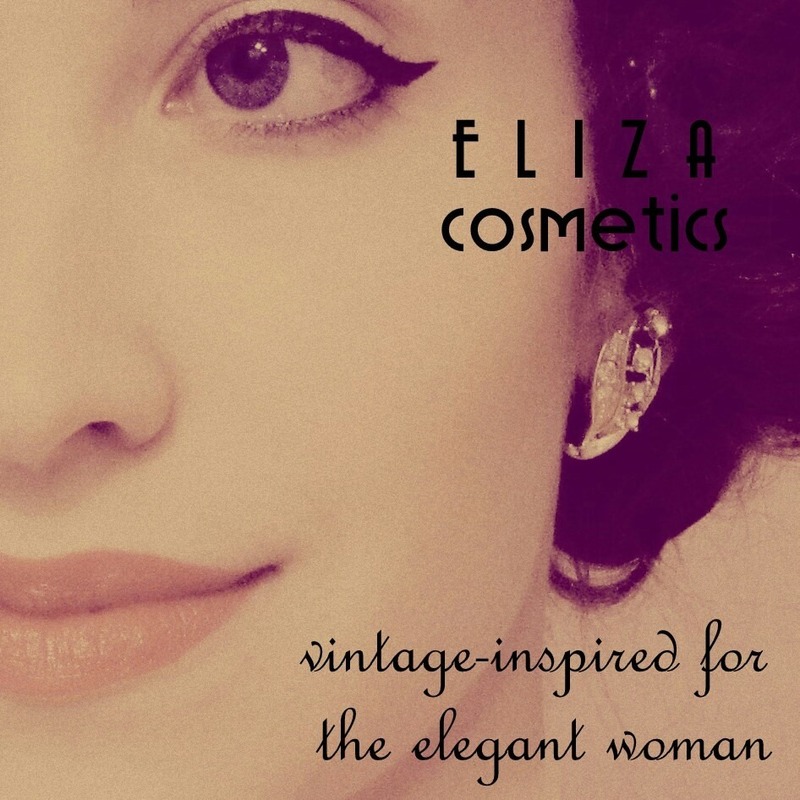 Getting closer to that vintage style! The last two photos are both from this month! This hairstyle can look so different depending on how you style it. Above, I brushed out the shortened bangs to make them a bit longer, and I like the almost pageboy curl in the back. Now we're getting places! Well, I'll keep trying to get the more authentic look that I've been wanting, and also I'm going to experiment with hair rolls and up-dos. I'm happy so far with the versatility of the middy cut, and also that I have less hair, so it washes and dries faster, yet I can still style it. So don't be afraid to try out a middy cut! If you go to a salon, make sure they know how to do this style the old-fashioned way, and don't let them use razor shears or thinning scissors, as you'll get a totally different effect. The hair looks a bit choppy when it isn't styled, so if you don't want to dedicate to styling it on a regular basis, this cut might not be for you. Interested in more in-depth styling tutorials? Let me know in a comment below! Thanks for reading!